Sergei Korolev, the father of Russian space exploration, said that if a seafarer should know how to swim then a space-faring cosmonaut should also know how to swim in space. Watching archive film of spacewalk pioneer Alexei Leonov as he first casts himself adrift from his vessel, he does indeed have the air of a young swimmer pushing away from the edge for the first time. His arms flail, his legs kick and he reaches repeatedly for his tether to pull himself back towards his ship. 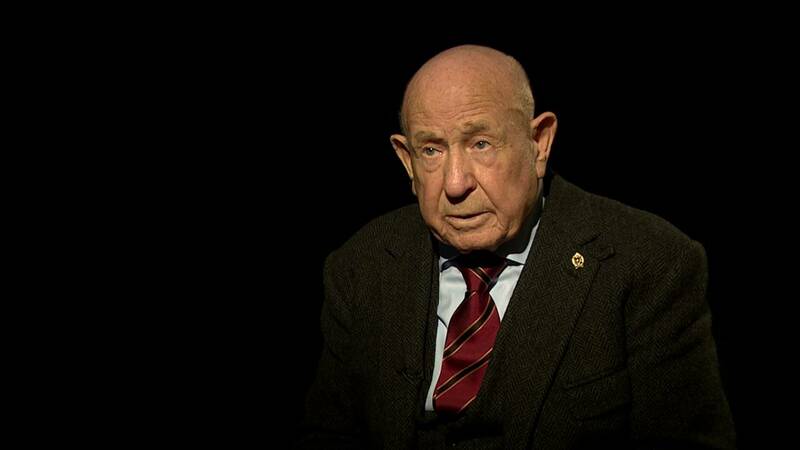 Euronews interviewed Leonov at the Starmus festival launch event, hosted by the Norwegian University of Science and Techology. He recounts that moment on March 18th 1965: “I stepped out, I held on – and I don’t remember saying these words, but, I said “The Earth is round after all! And then the silence, I could hear my heart beating, my heavy breathing, and nothing else”. Leonov is a living legend of space, a remarkably energetic 83-year-old, and a pioneering spacefarer who in 1965 did the bravest thing – climb out of the airlock of his Voskhod 2 spaceship and let himself drift free in the empty ocean of space around him. As he floated, it was Leonov’s serenity and clear-thinking that saved him from a fate worse than drowning. Drifting from a thick tether, his spacesuit expanded into the vacuum, leaving it not only stiff and unwieldy, but also too large to easily fit back through the hatch. The drama of Leonov’s spacewalk was watched live by Soviet leaders on the ground. This was the mid-1960s, the Cold War at its height , and orbiting Earth was starting to become old news. Both Soviet and American space racers were aiming at the next big thing. To be first to spacewalk would not just be a matter of trying a toe in the water, it would be a pioneering plunge into uncharted seas. Leonov’s spacewalk lasted 12 minutes, and his lasting impression is of the vastness of space around him. “The universe is infinite in time and space, the very black sky, black as coal, bright, un-flickering stars, and so many of them,” he told Euronews. Once he had forced his way back aboard the Voskhod 2, his mission encountered further stormy waters. As he and colleague Pavel Belayayev – the Michael Collins of Leonov’s mission – prepared to descend they realize the automatic guidance system was failing, forcing them to manually steer their way back into the atmosphere. Hurtling towards Earth, and enduring pressures up to 10G was definitely not an easy cruise. They still managed to navigate towards their home country but their descent resulted in a deviation from the original touchdown site. They landed in the middle of the dense Siberian forest, an isolated, freezing cold place full of wolves and bears, shipwrecked at a time long before mobile phones or GPS existed. They didn’t dare to go outside and spent the night inside the capsule, waiting, hoping to be found. They were fortunate enough to be spotted the very next day by Russian rescue team. After having a sip of brandy to celebrate, the cosmonauts used skis to ensure safe passage back to civilisation. From celebratory stamps to a feature film released in Russia this April, this incredible story has been celebrated over and over. Leonov has been awarded with many honours including an order “Pride of Russia” and a moon crater named after him, as a true legend of space deserves. Other than being the first man to spacewalk, Leonov also carries the title of being the first person ever to create an artwork in space. He accomplished this as he orbited Earth in Voskhod 2 during the spacewalk mission. Despite wearing a bulky spacesuit in an extremely tight cabin and facing zero gravity, Leonov managed to depict in colouring pencils what it was like to see the sunrise from space. Before joining the Soviet Air Force, Leonov attended the Academy of Arts in Riga, in 1953. Even throughout his training at the air force, Leonov never gave up on his artistic talent and attended evening art classes after a day’s training at the air field. After his spacewalk mission, Leonov made a series of paintings portraying his experience strolling the sky, a gift to those who at the time only had black and white images of space and could finally know what the colours of space were like.